Wow, I didn’t realize it’s almost been a month since I last blogged. I’m timid to blog now because all I really have going on in my life now is Hannah…at least that’s what it feels like. And I don’t want to just blog about Hannah. But I have stepped back in helping with the youth except for Sunday nights, which I love. And I pretty much just stay inside the house now that it is way to cold outside to want to do anything. We had a wonderful in PA for Christmas. We went back to the house that Tim grew up in. It had been over 4 years since he had last been there. We weren’t even dating at that time. Hannah absolutely loved meeting everyone and getting tons and tons of attention. Coming back home she has seemed kind of people deprived. But being sick the last couple days has made her appreciate a quiet home again. We got to see Tim’s parents and 3 of his siblings, all of his grandparents, cousins and aunt and uncle. We also got to meet up and eat with some good friends, and then my family drove up from Texas! I asked my parents for a 5 generation picture for Christmas, and although it was a lot of work and money to pull off, I got my Christmas gift and am very grateful for it! I was praying for a baby girl while pregnant. And not finding out what we were having was a test of faith with that. I wanted to have a baby girl to be able to introduce to my Great G’ma Z. At our wedding I got a 4 generation picture of me, my mom, grandma and great grandma. So in order to keep the generation of girls going, I really wanted Hannah! 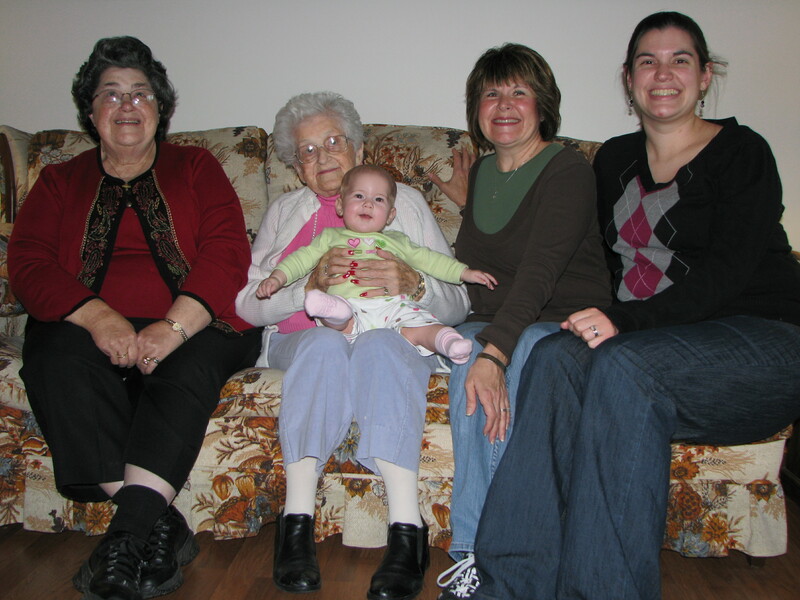 It was so nice to see my great grandma, and visit all our relatives on my mom’s side in Maryland. We figured out that the last time we saw them I was 12, and this time I was married and had a baby! Quite a change, and a wonderful visit. I posted some pictures of FB, and Tim put the rest of them on our online photo album. I just updated my photo link. So at the top of the blog click on Photo and then click on our picasa link to see all the pictures from vacation plus lots more of Hannah that we haven’t updated until this past week. This is such a great pic. of all of you with Great Grandma Z.
Dana, so glad your mom, my mom u and Hannah and all the rest of the family. The pic.s u got of Grandpa Mote & Hannah are just so cute. That is so good of my Dad. Am glad you got that. I love pics and they are so important & to look back at as years go by. So much fun to look back at when your babies grow up. Boy do we all change. God is so wonderful how he makes all of us different & special. Grandma Z looks really good.